With unparalleled views of England’s oldest working racecourse, the contemporary ABode Chester offers a warm welcome in the heart of the city, complemented by exceptional Brasserie style dining and stylish, sophisticated design. The atmospheric Brasserie Abode Bar with glamorous eclectic interior and contemporary vibe creates a unique backdrop for your perfect wedding. 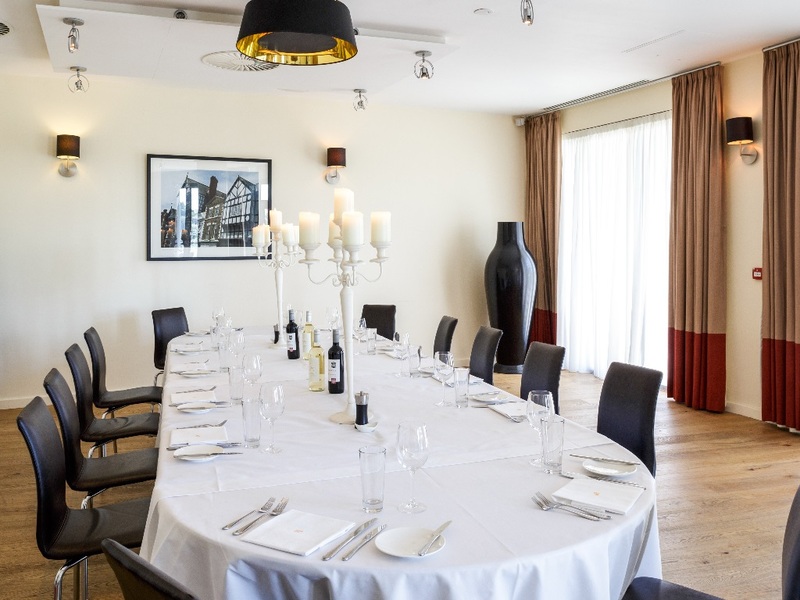 The elegant Tattersalls Suite, with private terrace and seating area is licensed for civil ceremonies, and its panoramic floor-to-ceiling windows make it an exquisite venue choice. Whether you dream of an intimate gathering of your nearest and dearest, or a lavish celebration with up to 80 guests, ABode Chester can to help you create the wedding of your dreams. The spacious Tattersalls Suite is fully licenced for your ceremony. Panoramic floor-to-ceiling windows with racecourse views flood the space with daylight and the outdoor private terrace is the ideal space for your guests to relax and enjoy the day. Enjoy your first meal as a married couple, selected from the delicious Brasserie Abode menu featuring classic dishes with plentiful sides, before cutting the cake and speeches to toast your marriage. Then let the evening entertainment roll as you and your guests hit the dancefloor to show off your best moves and party the night away! Guests will be welcomed to our special wedding showcase events with a glass of bubbly as we open the doors to showcase our beautiful wedding options and help inspire your perfect wedding day. Our Events team will be ready to guide you through the showcase, which will be held in the Tattersalls Suite set up for a wedding ceremony and breakfast to give you a feel of the options we can provide on your special day. For more information, please contact our Wedding Co-ordinator on 01244 347 000 or email events@abodechester.co.uk. b. Provisional bookings are only held for 14 days. e. Registrar fees are payable separately, directly to Cheshire County Council. b. Minimum package numbers apply for the Tattersalls Suite Package. a. No wine, spirits or other alcoholic beverages may be brought into ABode Chester by customers or guests for consumption on the premises. c. ABode Chester does not accept liability for any loss, damage to the clients or their property.